August 15th is Oregon Native Bee Conservation Awareness Day! The native yellow-faced bumble bee (Bombus vosnesenskii) foraging on western coneflower (Rudbeckia occidentalis) in a moist meadow on Mt. Ashland. 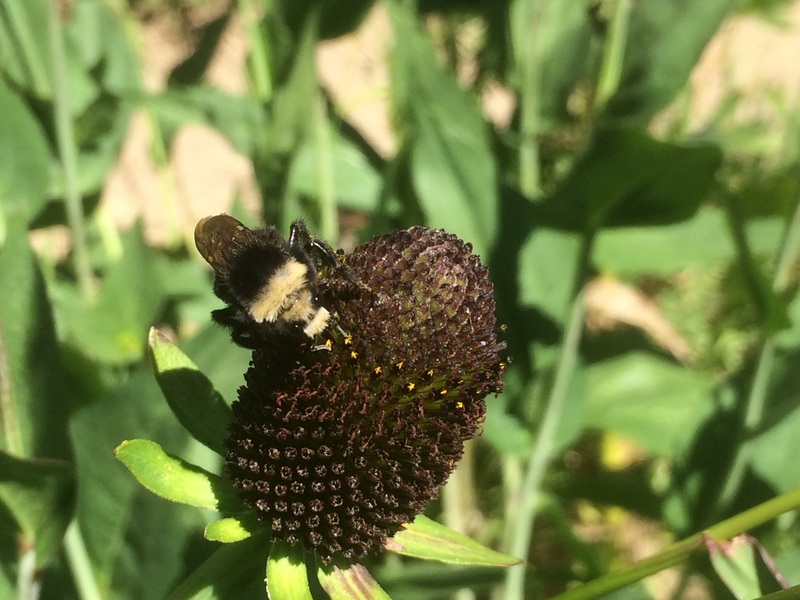 In honor of Oregon Native Bee Conservation Awareness Day I would like to feature a few late-blooming native coneflowers that our native bees love! 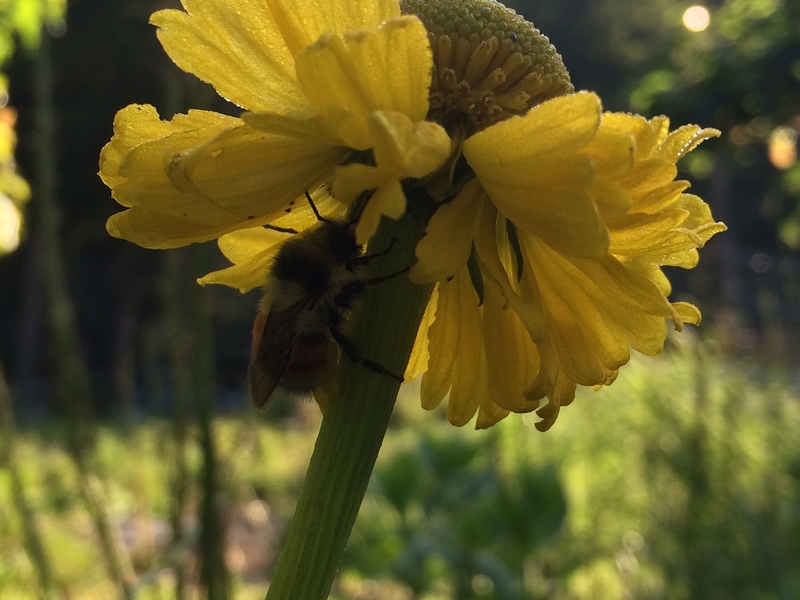 Klamath-Siskiyou native plants have coevolved alongside its native bees, creating a mutualism we should protect and support through land conservation and land stewardship. Native plants provide native bees with more nutritious food and better overall habitat than highly bred cultivated plants do. Plant natives for Oregon Native Bee Conservation Awareness Day! 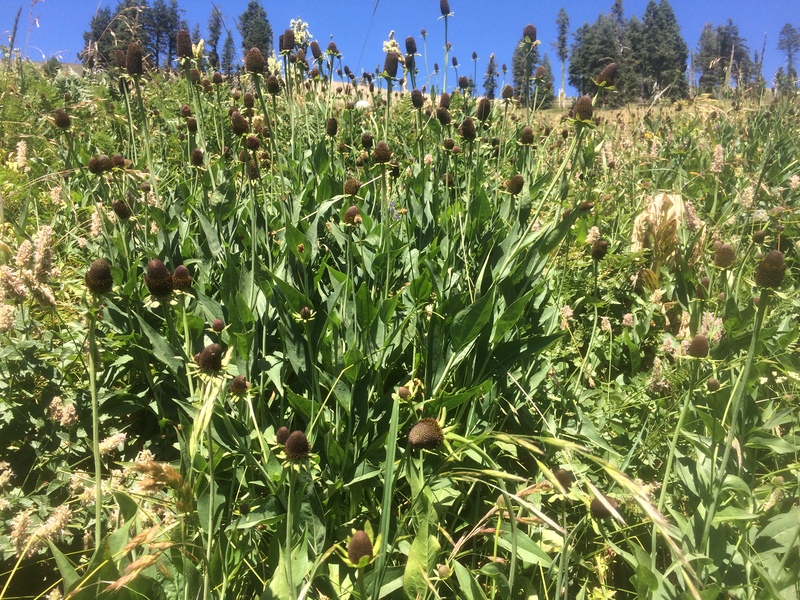 Did you know that we have native coneflowers in the Klamath-Siskiyou? Most people are familiar with the midwestern prairie coneflower: Echinacea. Echinacea is a great medicinal plant that pollinators love in the backyard garden setting; however, it is our native coneflowers that provide the best habitat for pollinators along local mountain streams and in intact mountain meadows. Coneflowers are part of the sunflower family! Western coneflower (Rudbeckia occidentalis) is a common plant in moist high elevation meadows in the Klamath-Siskiyou. This species is well-loved by native bees despite the lack of ray flowers (petals). It may be less showy to the human eye, but to native bees it is a forager’s paradise! Western coneflower (Rudbeckia occidentalis) in a moist meadow on Mt. Ashland. Our native Rudbeckias are related to black eyed susan (Rudbeckia hirta), a native to Eastern and Central North America and a commonly cultivated plant in the horticultural nursery industry. Waxy coneflower (Rudbeckia glaucescens) is found in wetlands in the western half of the Klamath-Siskiyou — from the Kalmiopsis Wilderness in Oregon, to northern California’s Smith River. 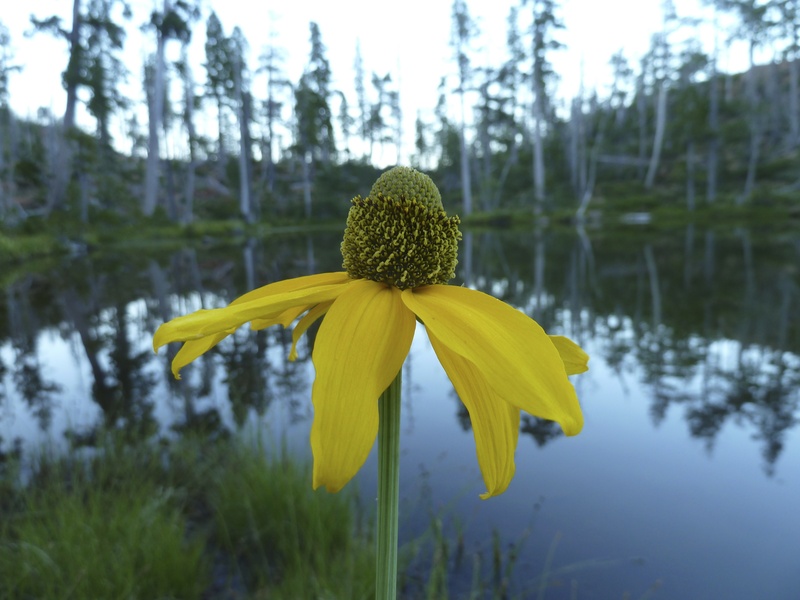 Waxy coneflower (Rudbeckia glaucescens) at Little Vulcan Lake in the Kalmiopsis Wilderness. Bigelow’s sneezeweed (Helenium bigelovii) brightens up meadows with its cheery yellow flowers. Native bees and butterflies are often found foraging and nectaring on sneezeweed flowers. The name sneezeweed comes from an historic use of the dried flowers and leaves as a snuff — not because the flower is an allergen! 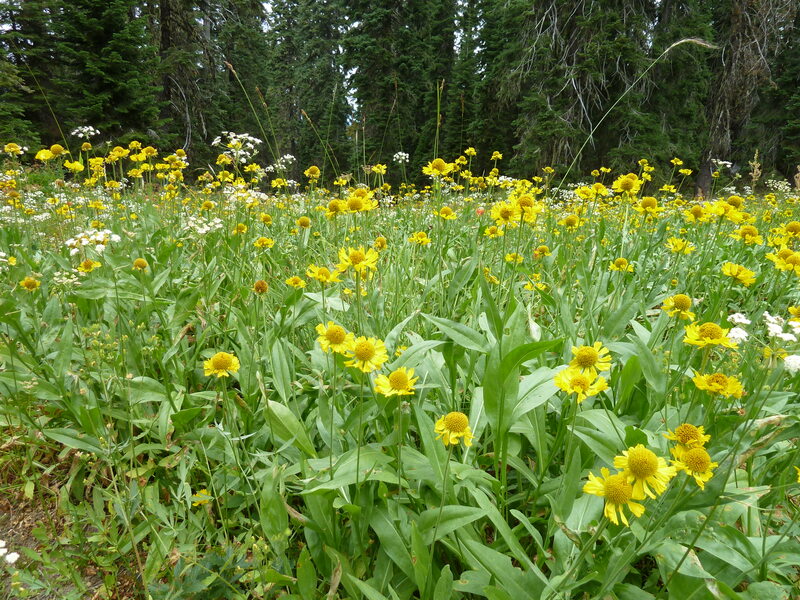 Bigelow’s sneezeweed (Helenium bigelovii) in the Red Buttes Wilderness. Male black-tailed bumble bee (Bombus melanopygus) sleeping underneath a sneezeweed flower in our garden.